Interiors and the trends thereof are tied in with the rag trade. And, as with the clothes on our backs, interior designers play with proportion. It’s an interesting thing to watch. Look at any fashion image which truly works on a model and it’s often because of sizes, lengths and exactly how they’re juxtaposed. Right now accessories are huge. Literally huge. Such as earrings which, when swinging, dust off your shoulders. They’re often super-colourful, maybe representing a slight challenge to the introverted. So it is with home design objects… light fittings, lamps, mirrors and decorative items. Currently they’re BIG. 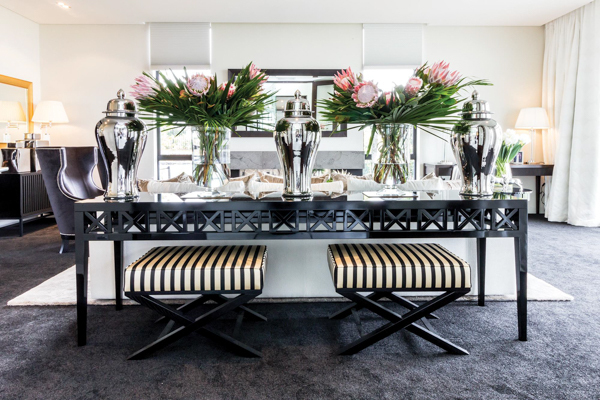 Perversely enough, a mega-sized, clashingly bright or patterned vase, bowl, clock, or piece of furniture can make even a small space seem richer, infused with more personality; more expansive. So no need to be shy! Take a walk on the opulent side.